Modern living spaces can be cozy but are often not very roomy, so we need to be creative with how we use our space. The Arius YDP-S34 digital piano helps you express that creativity through a stylish, compact design that brings elegance to any room - all the while delivering amazing sound quality. While the YDP-S34 boasts a modern, stylish look, it offers a traditional acoustic piano playing experience. Yamaha has well over a century of acoustic piano-making heritage and has tapped into this experience when designing and building digital pianos. From the moment you open the lid, sit down, and start playing, you’ll be immersed in the sound of the flagship Yamaha CFX concert grand piano. The 88 Graded Hammer Standard keys replicate the touch of a grand piano, giving you an authentic acoustic piano experience. The Yamaha flagship 9’ CFX concert grand piano offers sparkling highs and a powerful resonant bass with a sound that projects to the furthest reaches of any concert hall. The CFX was played by the winner of the prestigious International Chopin Competition in 2010, and has since gained recognition as one of the greatest concert grands of modern times. This feature reproduces the slight change in sound at the instant you remove your fingers from the keys. What’s more, different key-off sounds are produced for staccato and legato playing. When the hammer of a grand piano strikes its string, the other strings will also resonate. The YDP-S34 can reproduce this effect using its String Resonance feature. 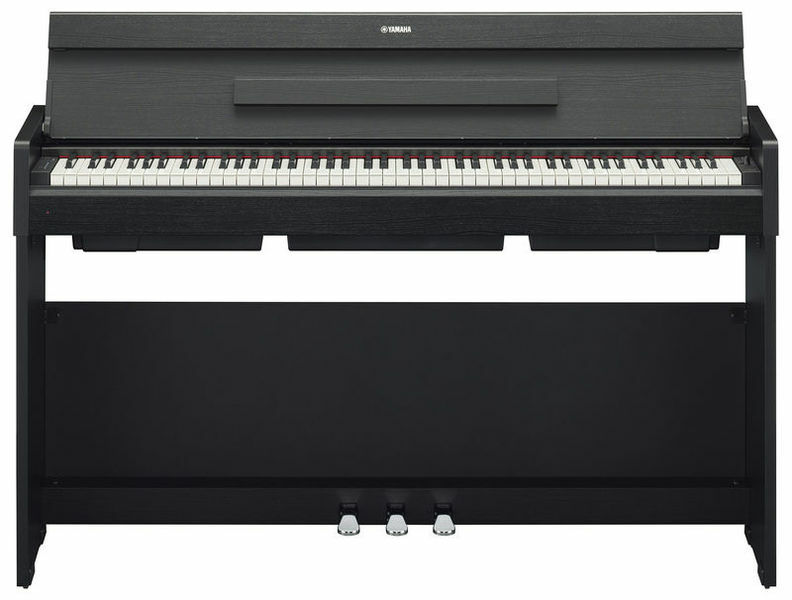 A Graded Hammer Standard (GHS) 88-key piano keyboard provides a heavier touch in the low end and lighter touch in the high end, and is similar to the acoustic piano. Newly designed speakers can deliver a very powerful sound from low to high notes, which is closer to a real acoustic piano. The YDP-S34 can also recreate the characteristic acoustics of the grand piano sound in a more realistic fashion by utilizing the following Yamaha technology. When using headphones, the Stereophonic Optimizer lets players enjoy the dispersed sound heard when sitting in front of an acoustic piano. With the Stereophonic Optimizer, Voices sampled from acoustic pianos appear to come from the body of the instrument. This provides a comfortable, natural experience that removes the drawbacks of performing with headphones. The speakers attached to the body exhibit a phenomenon in which, if nothing is done, the volume of the sound will increase due to the resonant frequency of the body. Conversely, installing pipes with the same resonant frequency within the body suppresses this resonance. Acoustic optimizers utilize this phenomenon.This improvement of the sound is something that has only been possible thanks to Yamaha‘s thorough knowledge of the internal acoustic characteristics of musical instruments. At low volumes, bass and treble used to be difficult to hear; however, YDP-S34 is equipped with Intelligent Acoustic Control (IAC), which adjusts the sound automatically, allowing players to enjoy balanced sound at any volume level. Have you ever tried to figure out what the chords are to your favorite songs? The Smart Pianist app is here to help! Smart Pianist helps you practice and perform your music by analyzing the songs stored in your music library and then displaying the chord symbols for you to play. The app also allows you to control the functions included in your Yamaha digital piano with your iOS device, for intuitive and easy operation. In addition to selecting piano Voices, you can use the Layer function to overlay Voices, or the Split function to play difference Voices with the left and right hands. A range of functions such as Transpose, Tuning, Pedal and acoustic settings can be configured easily and intuitively from the touch screen.